ROAD TOWN, Tortola, VI - The Antigua and Barbuda Meteorological Service through the Virgin Islands (VI) Department of Disaster Management (DDM) has issued a high surf advisory for the VI with high surf imminent from tomorrow, Thursday, January 24, 2019. According to a release issued today, January 23, 2019, long northerly swells of moderate height are already reaching the islands. These swells are expected to cause dangerous breaking waves (surfs) and life-threatening rip currents. “Seas: Rising to 2.5 metres (8 feet) today, 3 metres (10 feet) by tomorrow and falling to less than 2 metres (7 feet) Saturday. Seas will be occasionally higher, exceeding 3.5 metres (12 feet), mainly on Thursday,” the DDM noted. They say that surfs will over 2 metres (6 feet) are expected tonight and over 3 metres (10 feet) tomorrow and 2 to 3 metres (6 to 10 feet) on Saturday. “These conditions will be conducive for dangerous rip currents. 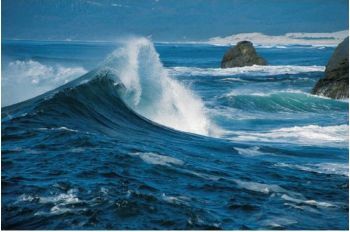 Please note that surfs could be as much as twice the height of swells,” the release warned. The DDM notes that strong currents can cause death and can carry even the strongest swimmers out to sea; cause injuries to beachgoers; beach erosion; sea water splashing onto low lying coastal roads; beach closures; localized disruptions to marine recreation and businesses; financial losses and more. Beachgoers should be extremely cautious and bathe only where lifeguards are present.